Liberian children resident in Nigeria over the weekend added another flavor to their annual celebration of National Flag Day this year. 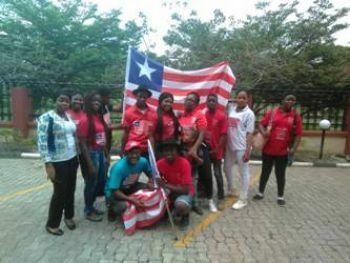 A release from the Liberian Embassy in Abuja says in addition to the traditional marching and eyes-right outdoor activities, the children dramatized Liberia’s “Declaration of Independence” and the “Making of the Liberian Flag, the Lone Star”. The program which took place on Saturday, August 25, 2018 on the premises of the Embassy’s compound in Abuja, was organized jointly by the Liberian Embassy and the Abuja Chapter of the Organization of Liberian Communities in Nigeria (OLICON), the release adds. August 24 of every year is a public holiday in Liberia in observance of National Flag Day. The day is in accordance with a National Legislative Act approved on October 25, 1915. The Embassy in Abuja, in conjunction with the Liberian Community, annually uses August 24 to bring together Liberian children in the Nigerian Diaspora as a means of teaching them the significance of the Flag, as well as other national historical events while they are far away from home. During Saturday’s program, the children began with an outdoor parade and eyes-right taking as Ambassador Al-Hassan Conteh, diplomatic officers of the Embassy and other Liberians, including the immediate past Vice President of the ECOWAS Court of Justice, Justice Wilkins Micah Wright, looked on. Other special guests of honor present at the weekend’s program included the Minister of State for Health of the Federal Republic of Nigeria, Honorable Dr. E. Osagie Ehanire and his Liberian wife, Dr. Mrs. Eleanor R. Neal-Ehanire. According to the release, the parade also included, this time, a ‘mayoress unit’ whose performance replicated what many on-looking Liberians described as a reminder of ‘pre-war days’. After the hoisting of the flag and the citing of the Pledge Allegiance, an indoor program climaxed the event where the children were again in full charge of all the main activities. The program included performances of a Liberian folk song, Liberian dances and a drama on the making of the Flag, the release continues. The Queen of OLICON, Ms. Grace Bala Pani, during the occasion, presented to the children dozens of exercise books as they prepare for a new academic year. Ambassador Conteh, in his remarks, hailed the children for their splendid performances and the organizers of the event for the colorful program. “Let me extend a very special thanks to our children, the children of Liberia for such an excellent program”, Ambassador Conteh remarked. He praised the children’s innovation of going back “in ancient time” to display what happened during Liberia’s formative years. The Liberian Envoy said the observance of National Flag Day symbolizes love for country. He then used the occasion to assure the audience of the success of President George Manneh Weah’s ‘Pro-Poor Agenda’ which he said will soon be fully unfolded. For her part, Madam Barbara Smith, the Chairperson of the Organizing Committee, expressed appreciation to the parents who allowed their children to commit themselves for regular practices that led to the successful hosting of the event. She further applauded some of the parents who personally got themselves involved in the event, the release concludes.